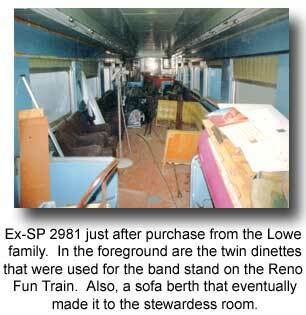 The Overland Trail is a 39 seat Club Lounge with Barbershop and Shower. 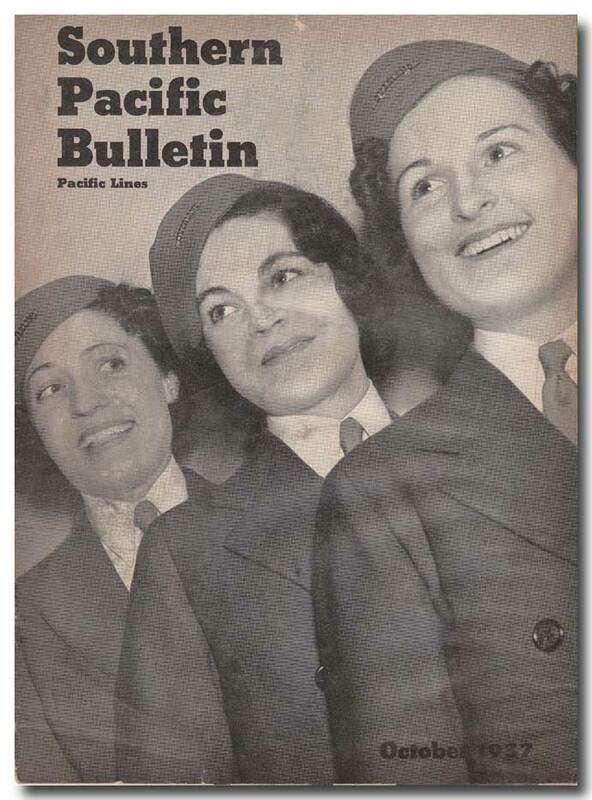 It was built by the Pullman Standard Car Manufacturing Company for delivery to the Southern Pacific Railroad in December of 1949. 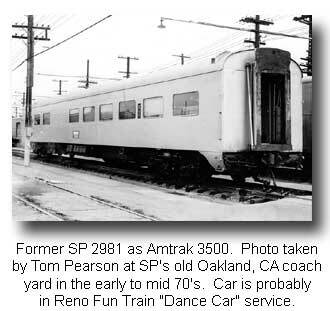 Numbered SP 2981, the car was specifically ordered in October of '47 for the San Francisco Overland, a train jointly operated by the Southern Pacific, Union Pacific, and the Chicago & North Western railroads between Chicago, IL and Oakland, (San Francisco) CA. while cars 2984 and 2985 (ordered June '46) were assigned to the Golden State. Car 2986 (ordered August 47) found itself assigned to the City of San Francisco. This car order (Lot 6806, which included cars of many different configurations) was actually part of a larger order of lot numbers 6805, 6815 and 6816. 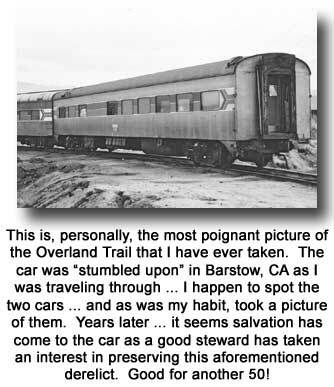 Between 1946 and 1954, the Southern Pacific purchased 261 new passenger cars at a cost of $48 million dollars (the Overland Trail cost approximately $200,000 when built). 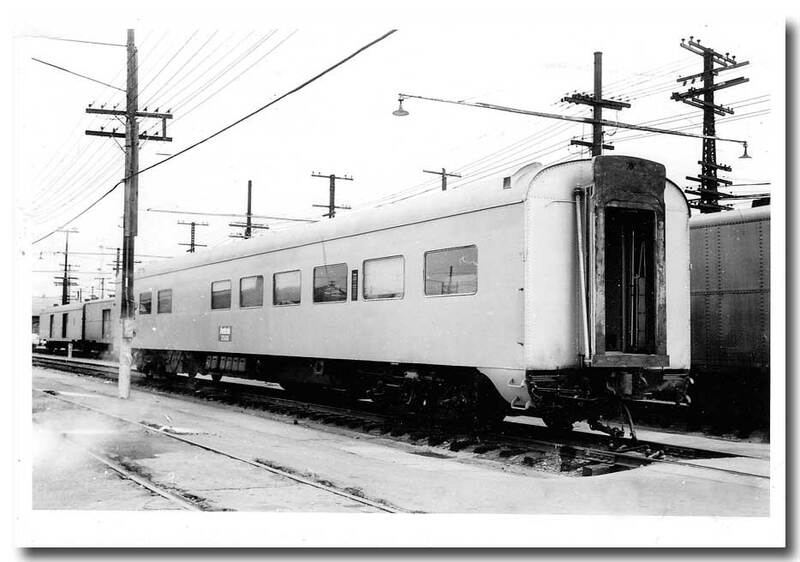 In 1949 and 1950 the Southern Pacific placed more new streamlined cars into service than any other two year period in the company's history. In 1950 alone, 119 new cars were placed in service. The Southern Pacific, along with many other major railroads, anticipated delivery of their cars right after the war ... they were eager to re-equip their worn out equipment after tremendous overuse during W.W.II. 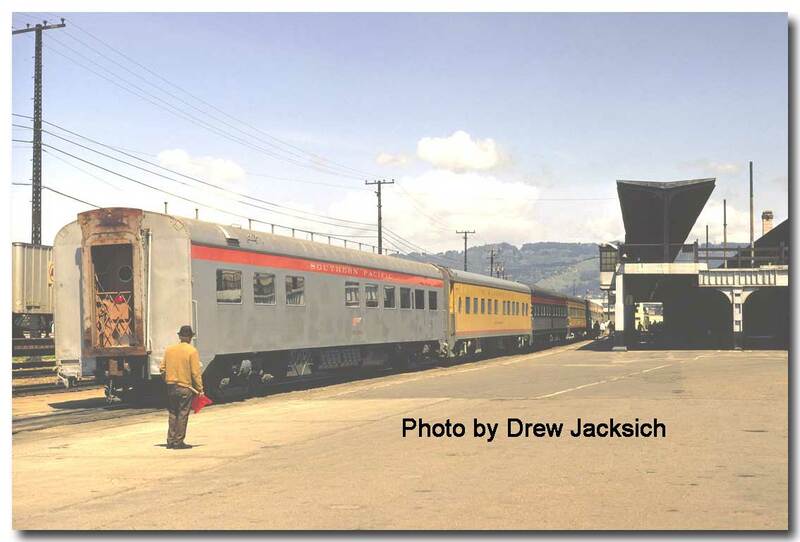 However, the demand for consumer goods, combined with continued post war material shortages, and rail car manufactures giving precedence to freight car orders, delayed delivery of passenger cars for several years. 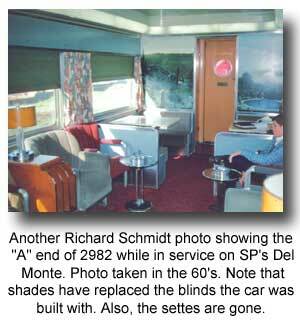 Southern Pacific club-lounge 2981, the first of the six barbershop lounges, was outshopped from the Pullman plant in Chicago, Ill. in December of 1949. 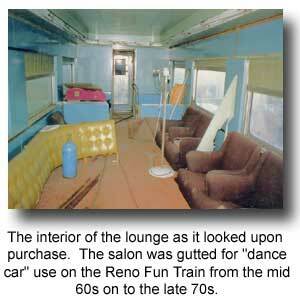 The lounge car was a standard 85 foot long car measuring 10 feet wide and 13'6" tall. 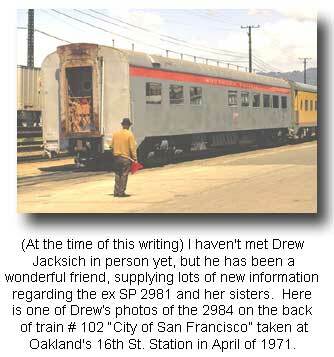 It was delivered in an elegant two-tone gray paint scheme (with white stripes separating the grays). The interior features a stunning Streamline Moderne 39 seat main salon with 16 seats at 4 tables with the balance of the seating made up of loose club chairs. A most gracious quarter-circle bar adorns one end of the lounge and is surrounded by deeply etched, diamond patterned decorative mirrors and etched glass partition "wings" (with a pine bough motif), while photo murals are featured on each side of the doorway at the other end of the lounge (opposite the bar) and depict Mount Lassen to the left and El Capitan at Yosemite to the right. Murals, applied to many different cars from this order, featured scenic highlights at locations all along the Southern Pacific's vast system. 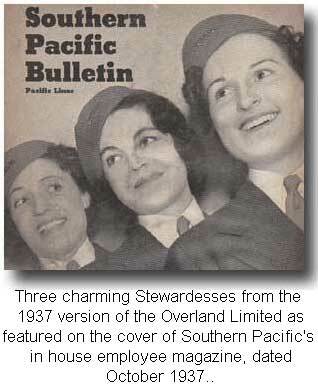 The murals were part of the Southern Pacific's promotion of tourist travel through-out Southern Pacific territory. During this period the company spent one million dollars annually on advertising, primarily on billboard ads reading "Next Time Take The Train." As stated, the 2981, 2982, 2983 and 2986 were originally assigned to the "Overland Route" which was the path of the original, historic transcontinental railroad. The transcontinental railroad was a joint project by SP predecessor Central Pacific which built from Sacramento, California east, and the Union Pacific Railroad which built west from Omaha, Nebraska. This route was completed joining east and west with the historic driving of the golden spike at Promontory, Utah on May 10, 1869. The third member of the "Overland Route" was the Chicago and Northwestern filling the gap between Omaha and Chicago. This total route covered 1,780 miles from Chicago to Oakland. 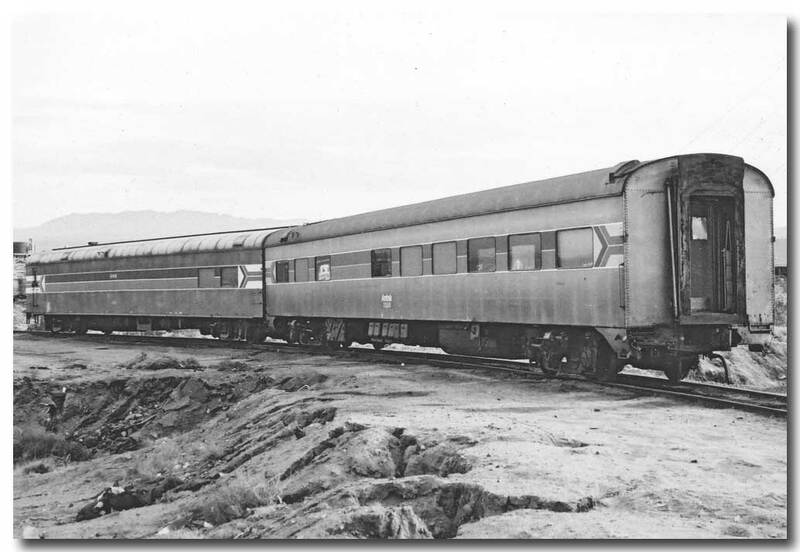 To elaborate on the joint operation, the San Francisco Overland was operated by the Southern Pacific from San Francisco/Oakland to Ogden Utah. The train was operated by the Union Pacific Railroad from Ogden to Omaha. The Chicago & Northwestern Railroad handled the final leg of service from Omaha to Chicago (the Milwaukee Road handled C&NW's portion from the mid 1950's to the Amtrak era). 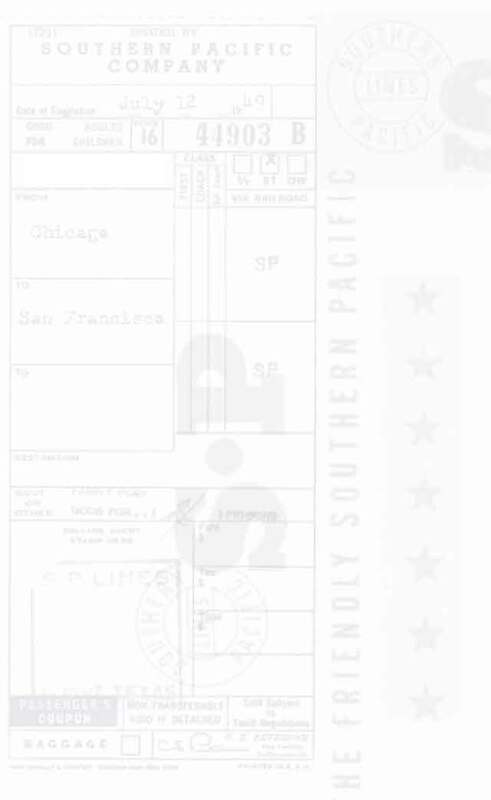 By September of 1950, the timetable shows train number 27, the west bound San Francisco Overland leaving Chicago at 8:00 PM daily, and arriving in San Francisco 48 hours and 55 minutes later at 6:55 PM. The final 35-minute leg of the journey from Oakland Pier to San Francisco was by the Southern Pacific Ferry. After a sixteen hour layover, the counter part, train number 28, would depart San Francisco at 11:00 AM and arrive in Chicago at 1:00 PM two days later. A section of the San Francisco Overland would continue from Ogden to Denver, Kansas City and St. Louis. 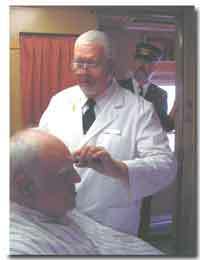 The Overland Trail is equipped with (what is thought to be) the sole operating streamliner era railroad barbershop in the world. Once a common feature aboard the premier trains of old ... the railroad barbershop succumbed to the realities of the jet age in the mid 50s. The honor of carrying the last barbershop probably falls to the famous Super Chief, flagship of the former Atchison, Topeka and Santa Fe Railway. 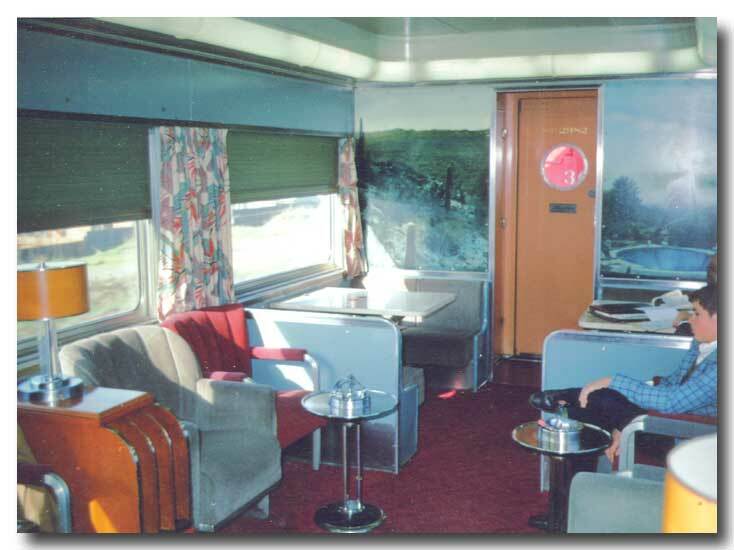 The train, affectionately known as The Train to the Stars, because of its Hollywood celebrity patrons, lost several premium services on January 10th 1954 including the barbershop. Stewardess Room: The Overland Trail was built with a special double bedroom that was originally designated as the quarters for the stewardess/nurse assigned to the San Francisco Overland. 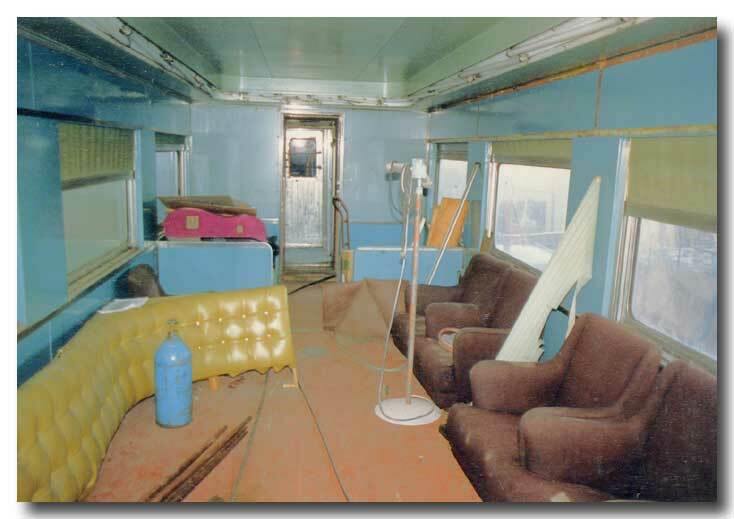 The physical bedroom quarters on board the Overland: Although the car was built after the war, the room is typical of prewar construction -- that is, the sink and toilet are in the same room as the bed. Most post war cars featured a toilet annex in each multi-bed room that helped ease the awkwardness of using the facilities while the room was occupied by your travelling companion. 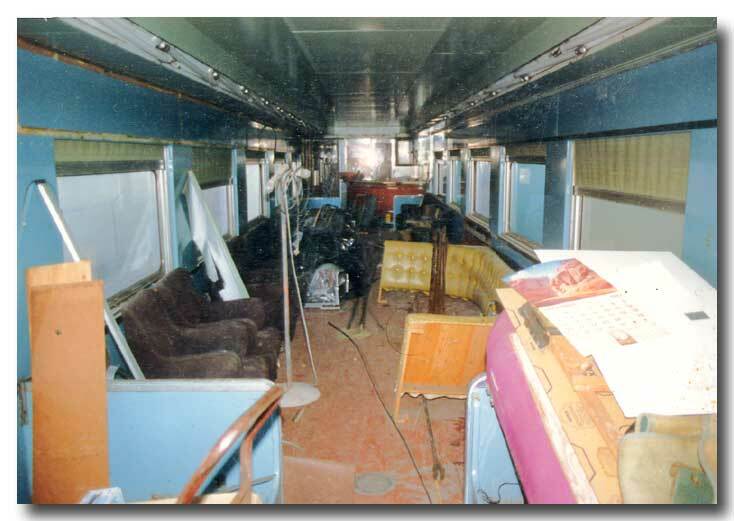 The room was designed with the very popular "full width" (perpendicular to the length of the car) lower sofa berth (which folded down for night use) plus the upper which folded away into the upper wall when not needed.